“First, the United States will keep all of its treaty commitments. Nixon gave South Korea even more reason for concern during his détente with communist China. During the Korean War, the U.S. intervened because it saw North Korea’s invasion as part of larger communist aggression, which justified spending U.S. lives and resources to turn it back. It was a major policy change to go from fighting Chinese communist “volunteer forces” in 1950 to sending secret delegations to Beijing to discuss the possibility of cooperation, and one that caused unease in Seoul about the U.S. commitment to standing up to communist forces on the Korean peninsula. This threatened the relevance of the anti-communist U.S.-ROK alliance, and opened the possibility that the PRC would ask for concessions harmful to the ROK’s security, such as Chinese Premier Chou Enlai’s request to Henry Kissinger to remove all U.S. forces from the Korean peninsula. The Nixon administration’s handling of the ROK during these years led Park to later write, “this series of developments contained an almost unprecedented peril to our people’s survival.” During the early 1970s, this fear of abandonment had real consequences, such as Park’s decision to pursue a clandestine nuclear weapons program, including negotiating with France to buy the technology necessary to create plutonium for a nuclear weapon. The ROK only quit the nuclear program after the U.S. discovered it in 1976. Another outcome was Park’s Yusin reforms, which he started in 1972 and which included the imposition of martial law, dissolution of the National Assembly, and the banning of all antigovernment activity. This policy led to abuses such as the jailing and torture of political dissidents and opposition figures. One of the reasons given for the Yusin reforms was the fear of U.S. unreliability and external threats that necessitated tighter domestic control. South Korea is a small country, and during Nixon’s presidency was still relatively poor and weak. Despite this, during the Vietnam War, the ROK demonstrated its commitment to the U.S.-ROK alliance by sending 312,853 soldiers to fight alongside U.S. forces, more than any other U.S. ally did. It is understandable that strategic interests dictate U.S. foreign policy, rather than a sense of warm feelings towards South Korea; however, this neglect can have serious implications for U.S. strategy in East Asia. If Park had been successful in building a nuclear weapon, it would have shaped the security calculations of every other power in the region, and would have harmed the overall goal of U.S. nuclear nonproliferation. Nixon’s options in Asia were constrained by the failure of U.S. strategy in Vietnam, so the removal of U.S. troops from the Korean Peninsula as well as the caution demonstrated in response to North Korean provocations were arguably prudent responses to reality. Still, the lack of attention towards a partner that had fought and died alongside the United Sates in Vietnam was shortsighted and weakened the U.S.-ROK relationship during Park’s time in office. Nixon created his policies based on a reaction to the failed Vietnam War, with repercussions for all U.S. allies in Asia. However, Nixon did not call for a total withdrawal of U.S. troops from South Korea. This is in contrast to President Jimmy Carter (1977-1981), who used the call to withdraw as part of his presidential campaign. Carter’s desire to pull American troops out of the ROK came from, at least partially, his repulsion at the human rights record of ROK President Park. Like the Nixon Administration, Carter neglected ROK concerns and interests when developing his plan to withdraw troops from the peninsula. In this case, Carter developed his plan without consulting the ROK, and even, through Vice President Walter Mondale, notified Japan of his intention to withdraw U.S. troops from Korea one month before notifying the ROK. This lack of consultation deeply angered Park, and resulted in a tense meeting in 1979 when Carter visited South Korea for a summit. During a meeting at the summit, Park lectured Carter for forty-five minutes about why pulling all the troops out of South Korea was ill advised, despite Carter’s staffers telling him earlier that Carter did not wish to speak about the troop withdrawal issue at the summit. The meeting left Carter deeply angered. One reason why Seoul was so concerned by the prospect of a complete U.S. troop withdrawal was the importance of the tripwire function U.S. troops play on the Korean peninsula. If there are U.S. troops in South Korea, then North Korea would kill them in any invasion. If North Korea kills U.S. troops, than that would ensure that the United States become involved in fighting North Korea and pushing them out of South Korea again. If Carter had successfully withdrawn all U.S. troops from the ROK, it would have removed that tripwire function, signaling to the DPRK that U.S. support was no longer guaranteed. While Carter insisted that the U.S. would maintain its treaty obligations, would provide air coverage, and would help the ROK build up its own forces, after the Vietnam War, it was unlikely that the U.S. people would be willing to support another large-scale ground war in mainland Asia. Ultimately, despite Carter’s absolutist goals, during his time in office he only brought about 3,000 U.S. troops home. Carter predicated his withdrawal plan on the belief that South Korea would be able to defend itself from another DPRK invasion. Ultimately, it was the discovery that this assumption was false that prevented the withdrawal from taking place. This assessment changed due to the work of John Armstrong, an Army officer who was assigned to analysis intelligence about North Korea during this time. Armstrong discovered that North Korea’s military was far stronger than had been previously assumed. Armstrong’s work influenced Army generals, members of Carter’s own bureaucracy, and Congress, who then put pressure on Carter to reconsider the withdrawal. Three weeks after Carter’s trip to Seoul, his National Security Advisor Zbigniew Brzezinski announced that the U.S. would postpone further troop withdrawals until 1981, and that they would depend on “credible indications that a satisfactory military balance has been restored.” The deadline was made meaningless when Carter lost the election for his second term and Ronald Reagan became president. After Carter, no other U.S. president has attempted to withdraw all U.S. ground troops from South Korea. However, this does not mean that the ROK fear of abandonment has disappeared, or that it is not possible for the U.S. to change their alliance policy in ways that affect ROK security. One recent example of this is Secretary of Defense Donald Rumsfeld’s announcement in 2003 that he intended to withdraw or relocate U.S. forces in 2013, believing them to be an outdated remnant of the Cold War. The reasoning that Rumsfeld offered was similar to that of Carter, with Rumsfeld pointing out that since South Korea had a powerful economy and a better-equipped military, Seoul had “all the capability in the world of providing the kind of up-front deterrent that’s needed.” The Iraq War was highly unpopular in South Korea; however, the threat of the U.S downgrading alliance ties was enough to convince the South Korean government to send ROK forces to Iraq when the United States requested it. Yet, as the Nixon Doctrine demonstrated, ROK participation in U.S. wars does not guarantee strong alliance relationships – a downgrading could still occur. 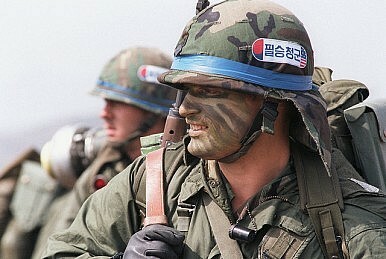 For example, in 2004, the U.S. moved 3,600 U.S. troops from South Korea to Iraq. For the United States, it is important to be aware of abandonment fears of its allies. Awareness of these fears does not mean that U.S. strategy should be held hostage to them, but as in all relationships communication is important. Rather than consult with the ROK, Nixon and Carter unilaterally made plans that had serious implications for ROK security, and even let other parties know before South Korea. ROK feelings of insecurity can result in outcomes that are not in America’s best interests, such as Park’s secret plan to build a nuclear weapon. For the ROK, it is important to realize that the U.S-ROK alliance is not an iron-clad guarantee, but a relationship that the ROK needs to tend carefully. Carter was clear that Americans found Park Chung Hee’s human rights violations repugnant and that this divergence in the U.S. and ROK government’s values was a factor in the planned troop withdrawal. While the ROK is today a liberal democracy that is closely aligned to the United States, maintaining close relations should remain a priority and should not be taken for granted. However, no matter how much communication and relationship building the United States and the ROK commit to, as the weaker partner in the relationship, it is likely that the ROK’s abandonment fear will play an important role in the alliance as long as it exists.